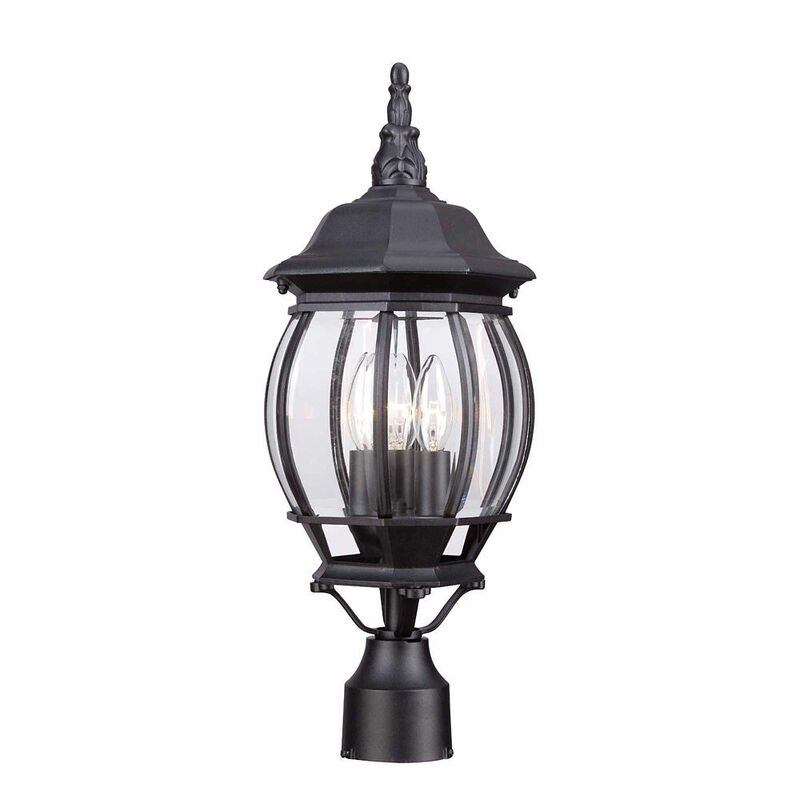 This Hampton Bay 20.75-inch outdoor post lantern features a solid black finish and eight sides of clear, beveled glass. This simple, elegant design compliments any exterior decor. These fixtures are built with cast aluminum to last, and they are suitable for use in wet locations. The cornerstone of the Satin Collection is quality, and this halogen outdoor post lantern is no exception. Combining a classic bronze finish and posh styling, you will find no better way to highlight the charm of your home. With the superb craftsmanship and affordable price this fixture is sure to tastefully indulge your extravagant side. The cornerstone of the satin Collection is quality, and this outdoor post lantern is no exception. Combining a classic black finish and posh styling, you will find no better way to highlight the charm of your home. With the superb craftsmanship and affordable price this fixture is sure to tastefully indulge your extravagant side. The Progress Lighting Meridian Collection Textured Black 3-Light Post Lantern is distinctive and stately and exudes a feeling of old world elegance. It was designed with bold cast flourishes and fluted details. A clear, seeded glass diffuser adds rich texture and offers you low-maintenance operation. With a stately design and fine craftsmanship, the Progress Lighting Prestwick Collection Oil-Rubbed Bronze 3-Light Post Lantern was built from durable aluminum to give you years of enjoyment. The yoke design cradles an urn-shaped water glass shade. A rich hand-painted finish provides an artistic touch for a touch of distinctiveness. 60W 3-Light Black Outdoor Post Lantern with Clear Bevelled Glass This Hampton Bay 20.75-inch outdoor post lantern features a solid black finish and eight sides of clear, beveled glass. This simple, elegant design compliments any exterior decor. These fixtures are built with cast aluminum to last, and they are suitable for use in wet locations. 60W 3-Light Black Outdoor Post Lantern with Clear Bevelled Glass is rated 4.3 out of 5 by 109. Rated 5 out of 5 by Awesome from Beautiful light. Looks awesome!... Beautiful light. Looks awesome! Rated 5 out of 5 by SpyderNut from Easy to install.With the right lightbulbs, looks great!... Easy to install.With the right lightbulbs, looks great! Rated 5 out of 5 by Nmaczack from Have had if for a month now and working great. Perfect product if you’re not trying to spend a lo... Have had if for a month now and working great. Perfect product if you’re not trying to spend a lot of money. Very happy with it.